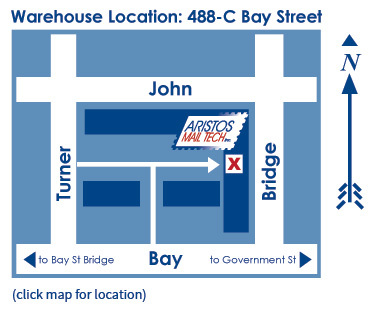 Aristos Mail Tech is a direct mail house located in Victoria BC that provides a range of direct mail preparation and data management services. We have been working with a wide variety of businesses, associations and non-profit organizations since 1989 to assist them in dealing with the post office. Everything from the home-based business to large corporations, as well as non-profit and educational institutions have used our services. Our client base has mailings as small as 300 pieces to as many as 100,000 or more. We know Canada Post rules and regulations and work hard to make every one of your postage dollars count! Our dedicated staff with years of experience are at your disposal to make your mailing campaign a success. Our mail service reputation has been built on: attention to detail; quality control; customer service and meeting your timelines. Our success is built on long term relationships with our clients through the delivery of quality, cost effective mailing related services. Please browse this website for more information on our services. Call or e-mail if you have any questions.